The annual trade show for publishers, the American Bookseller’s Association, would have been especially exciting for Jim in 1984. His publishing department, known by its acronym as HOP (Henson Organization Publishing) was running on all pistons. Their information kit for the show included one-sheet flyers marketing books that featured the Muppets (with most starring Miss Piggy), The Dark Crystal, Muppet Babies, and also Muppet Magazine and cartoon collections. But perhaps most thrilling was the extraordinarily robust Fraggle Rock program with publisher Holt, Rinehart & Winston. 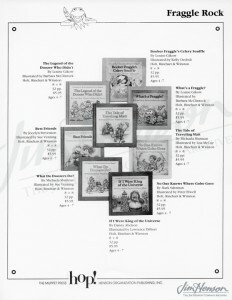 Just a year and a half after the show’s debut, Fraggle Rock was a big enough hit to merit a series of small format storybooks, several large scale picture books and a collection of coloring/activity books. And in support of the international intentions of the series, the publishing program extended to the UK, throughout Europe and to Australia. You could read Red and The Pumpkins in Norwegian (Vips Og Gresskarfroet) or Finnish (Red ja Kurpitsat), If I Were King of the Universe in Spanish (Si Yo Fuera Rey del Universo), What’s A Fraggle? in Swedish (Vad ar en Fraggel?) or Radish Day Jubilee in French (Le Jour du Radis). The tremendous care that went into crafting each Fraggle Rock script made the transition to storybooks seamless. It was easy to take fully formed storylines with characters that translated well into artwork and make compelling reading experiences for children. The joyful play of the Fraggles lent itself well to activity and coloring books. And, as intended, the situations the Fraggles encountered translated into any language. The publishing world has changed in ways Jim probably never imagined in 1984, but the timelessness of the Fraggles has allowed them to keep up. While the enjoyment a child gets from looking at an actual book is never outdated, there are many new ways for kids to get a reading experience. 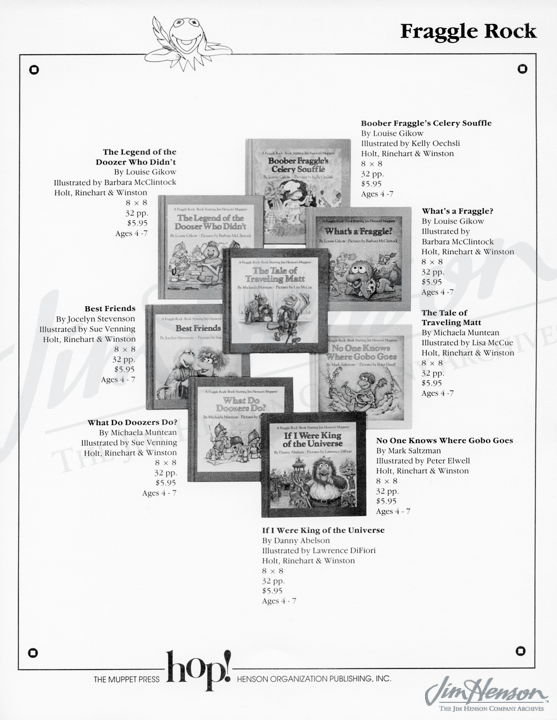 To that end, The Jim Henson Company has worked to bring Fraggle publishing into the digital age. This month the “Fraggle Friends Forever” app was released with Cupcake Digital. This interactive story can be read in three different modes: Read & Play, Read to Me, and Just a Book, allowing young readers to enjoy the narrative, color and animations at their own level. Interactive learning games and activities include number and letter recognition along with old-fashioned coloring pages. And in keeping with the idea that children learn more in the presence of a caring adult, parents are provided with questions to spark conversations with their children about what they are interacting with on the screen. What would Travelling Matt make of it? Marketing sheet for Muppet publishing program, 1984. Marketing sheet for Fraggle Rock publishing program, 1984. 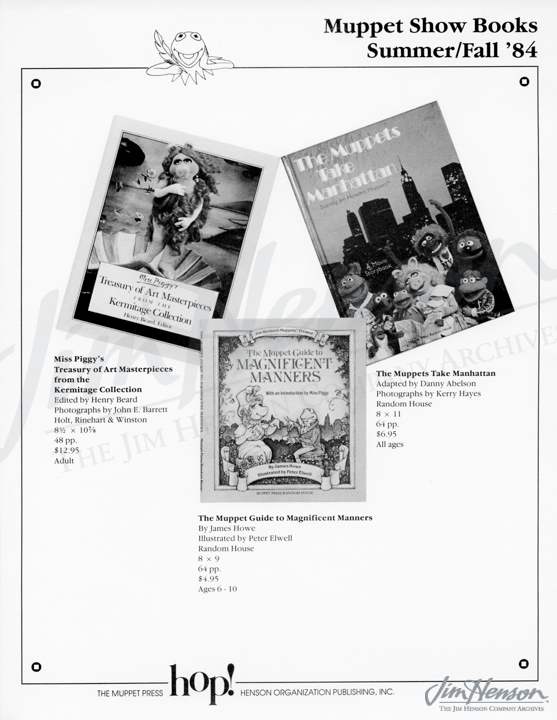 This entry was posted in 05-May '84, 1984, Appearances and tagged American Booksellers Association, Fraggle Rock, Henson Organization Publishing, Holt, Miss Piggy, Muppet Babies, Muppet Magazine, Muppets, Rinehart & Winston, The Dark Crystal, Washington. Bookmark the permalink.